Crown Publishers. 2013. 559 pgs including detailed footnotes and index. Other books I’ve read by Fink: none. She received the Pulitzer Prize for journalism for her 2009 article in the New York Times magazine on this same subject. Fink is a Stanford University-trained doctor and PhD researcher. She has provided aid and medical relief in combat zones. This is one of the most disturbing books I have ever read. It is also a book that will have to substitute for a criminal trial, since the people accused of ending the lives of helpless hospital patients were never brought to justice. Hurricane Katrina was one of the worse natural disasters in U.S. history. Almost 2,000 people lost their lives in the 2005 storm and subsequent flooding. This book is about the effect of the storm on Memorial Hospital, located in uptown New Orleans. When the levies broke, Memorial was completely surrounded by flood waters almost to the second story — trapping patients, staff and visitors and destroying the emergency electrical generators located in the basements. Plunged into darkness, heat and chaos, the stranded staff endured five days of terror and confusion. While stories of valor and clear-thinking emerged (the entire NICU was evacuated by helicopter with every baby saved) a darker picture emerged as the flood waters receded. After all staff and patients had been evacuated, 45 bodies were discovered in the hospital chapel — the highest number of any of the New Orleans hospitals caught in the flood. Autopsies revealed a deadly level of morphine and other sedatives in the bodies of a number of the deceased, and patient records determined that these drugs had not been prescribed. What was determined much later, through detailed investigations and even the free admission of several of the doctors — was that seriously ill, fragile patients were euthanized instead of being evacuated, because there seemed to be no way to move them out of the hospital. Their continued presence and stubborn clinging to life meant the staff could not leave the heat-choked, stinking hospital. And in the doctors’ minds, they were going to die anyway. Memorial Hospital, 2007. Photo Credit: Infrogmation. Creative Commons license. The majority of the patients who received the high doses of morphine and midazolam occupied the floor of the hospital set aside for nursing home occupants. They were primarily elderly and had DNR (“Do not resuscitate”) orders in their charts. But even a younger, very obese patient was euthanized. Many patients were alert and cognizant. Several had family members present who were forced away from their bedsides — either by police who were supervising the evacuation, or by staff members. Chillingly, they all died the same morning — even while rescue helicopters were landing on Memorial’s roof. The first half of this book is a compulsive, page turning read depicting the events of the storm and the five days of confusion, terror, and death. The second half traces the criminal investigation, the bungling of the district attorney, the publicity campaigns on behalf of the accused nurses and doctor and eventually, the grand jury’s failure to indict. This half of the book is somewhat more difficult to get through, but detailed footnotes and a chart of significant individuals and their affiliations helps keep everyone straight. There are so many layers to this book. You can read it as a horrific crime story — from the point of view of the perpetrators and the victims. It is a stern warning about the lack of emergency planning. In a larger sense it is the tragedy of an inept local and federal government who failed to respond to a disaster. It is also a study in the ethics of disaster management and triage. But one questions kept coming back to me: why did the staff at this hospital react in this deadly way? For these acts were personal choices carried out by several doctors and nurses — and other staff knew the euthanasia was taking place. 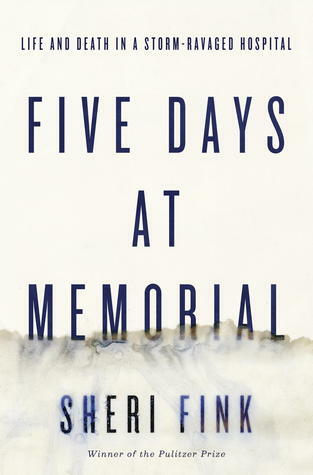 Why did Memorial’s staff choose death as an option, when other approaches were possible? To me, one of most fascinating and tragic “what-if’s” of this tale relates to the comparison between events at Memorial, and those at Charity, another New Orleans hospital. 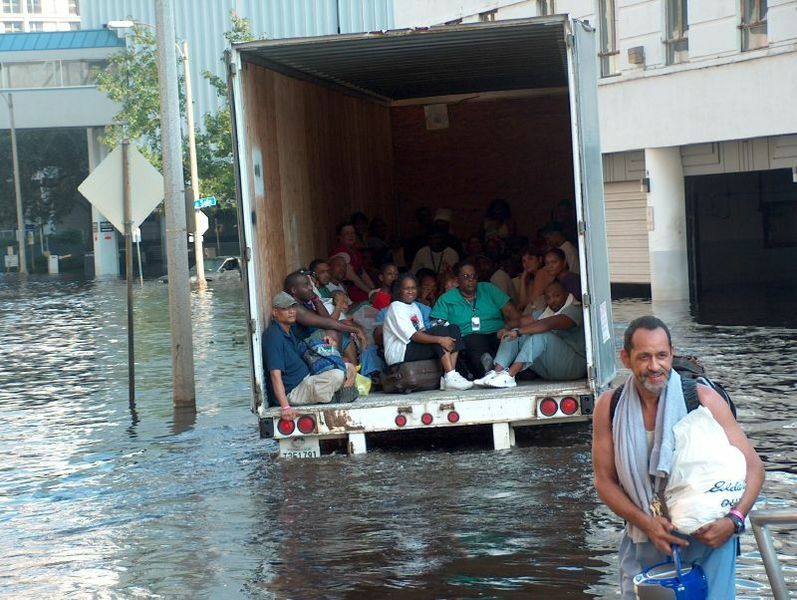 Katrina evacuations near Charity Hospital, New Orleans. Photo Credit: Frogmation. Creative Commons License. Charity had a larger patient census and fewer staff during the storm, and was also flooded and stranded. But fewer than ten patients died at Charity during the storm and its aftermath. Charity kept their regular shift schedule and as much as possible, continued normal medical care. Staff were released to sleep and rest. In contrast, Memorial went into “survival mode” where normal routine was abandoned. Charity evacuated their sickest patients first; Memorial assigned the sickest patients, and those with DNR orders into a perilous “Category 3” status. Most of the deaths occurred here. Charity had drilled for a category three hurricane. Memorial’s plan existed primarily in binders no one consulted. Most interestingly to me, Charity kept a positive, upbeat tone with frequent staff meetings throughout the day that included everyone — from doctors to janitorial staff. Management also forbade rumor spreading. A “you can only say it if you see it” policy was enforced. The staff even put on a talent show by flashlight to support morale. In contrast, dark rumors ran rampant at Memorial. Staff thought they were under martial law (they were not) and were convinced the hospital was going to be invaded every moment by rampaging gangs. Leadership was confused and diffused. Several c-suite staff from corporate headquarters were actually present at the hospital during the storm, but they had found a refuge in a remote office that through some fluke of electrical circuity still had power and air conditioning. This book made me angry. Not only the levies collapsed in New Orleans, but at Memorial — standards of ethics, morality, and even human decency collapsed as well. There are many lessons from this tragic crime. One of the simplest is that there is always a place for strong, sensible and clear leadership in every crisis. If only the leaders (if they existed) at Memorial could have stepped up — then some sane choices would have been made and those who depended on the quality of others’ choices would have survived the five days.